UN, November 26. /TASS/. Seven members of the UN Security Council have voted against Russia's agenda of the emergency session dedicated to the violation of Russia’s borders by Ukrainian military vessels, while China, Russia, Kazakhstan and Bolivia voted in favor of it. Four more countries have abstained from the vote. The UN Security Council will still discuss the situation in Ukraine during the session called at the US’ initiative under Kiev’s agenda. 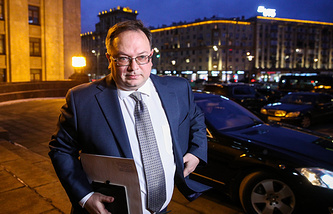 Russia's First Deputy Permanent Representative to the UN Dmitry Polyansky stated that in this way, "the Security Council discredits its work, just like the Ukrainians are currently discrediting the General Assembly through their provocative actions." "Yesterday, after Russia had requested this Security Council session to be held, our Western partners tried to present it as if it was Ukraine, not Russia, who had requested it. Gentlemen, this is just petty. As measly as it gets," the Russian diplomat said. "Nobody can prevent Russia as a permanent member of the Security Council to raise the issues that we deem important under the agenda they relate to," Polyansky added. According to the Russian Federal Security Service (FSB), on Sunday morning, three ships from the Ukrainian Navy - the Berdyansk, the Nikopol and the Yany Kapu - illegally crossed Russia’s border. They ignored legitimate demands to stop issued by vessels belonging to the FSB Border Service and the Black Sea Fleet and continued to perform dangerous maneuvers. In order to stop the Ukrainian ships, the Russian forces had to use weapons and detain the three vessels. Three Ukrainian military servicemen suffered light wounds and were provided with medical assistance.